Obtaining accurate estimates of energy and the digestible amino acid and phosphorus content of feed ingredients is one of the most important factors for achieving precision swine nutrition when formulating diets. Using accurate nutritional composition values minimizes the risk of overfeeding or under-feeding energy and nutrients relative to the pig's requirements. They are also important for capturing the greatest economic value of feed ingredients by minimizing "safety margins," which are frequently used to manage uncertainty in the nutritional composition of feed ingredients used in formulating swine diets. Furthermore, if nutritionists have confidence in the energy and digestible amino acid values of the sources of feed ingredients they are using, they are more likely to increase diet inclusion rates if the sources are competitively priced to obtain greater diet cost savings. Nutrient content varies in all feed ingredients, but some animal nutritionists often complain that the nutrient content among dried distillers grains plus solubles (DDGS) sources is too variable for them to use compared with other common feed ingredients. While it is well documented that the energy, nutrient content and digestibility are variable among DDGS sources, they are no more variable than the nutrient content of other common feed ingredients. In fact, Tahir et al. (2012) conducted a feed ingredient analysis survey of common feed ingredients used in North America and calculated the coefficient of variation (CV) for several chemical components. Their results (Table 1, page 32) showed that the CV of crude protein was less among samples of DDGS (5.4%) than among samples of corn (8.7%) and wheat (19.1%). Furthermore, DDGS had the least variability in neutral detergent fiber (NDF) and phosphorus content compared with corn, soybean meal, wheat and canola meal. However, as expected, the variability in crude fat content was the greatest among DDGS sources due to the fact that the majority of U.S. ethanol plants partially extract variable amounts of corn oil prior to manufacturing DDGS. However, the high CV in crude fat content can be partially attributed to the greater average crude fat content of DDGS (11.6%) compared with the crude fat content of the other ingredients (0.8-3.2%) used in this comparison. The nutrient composition of feed ingredients changes over time. Therefore, relying on “static” published book values from old published databases can lead to significant overestimation or underestimation of the actual energy and nutrient content of commonly used feed ingredients. This is even more critical for DDGS, because the nutrient composition continues to change as ethanol plants adopt new processes to improve ethanol yield, extract more corn oil and enhance protein and amino acid content. Therefore, when determining appropriate and accurate nutritional values for DDGS, it is important to consider the dates of publications used to compile these databases, because the nutrient composition began changing when the U.S. ethanol industry began partially extracting corn oil in 2005. Today, more than 95% of U.S. ethanol plants are partially extracting corn oil, resulting in a high proportion of DDGS sources containing 5-9% crude fat, compared with conventional sources containing 10-13% crude fat. This reduction in oil content not only increases the variability in crude fat content among DDGS sources, but it also changes the profile of other nutrients. However, although many nutritionists often assume that crude protein and amino acid content increase as the crude fat content decreases in DDGS, this is not always the case. There is often a disproportionate increase in all other chemical components of DDGS as the crude fat content is reduced. Prior to conducting research to determine the impact of reductions in crude fat content on the metabolizable energy (ME) and net energy (NE) content of reduced-oil DDGS, the National Research Council’s (NRC) swine committee reasonably assumed that the reductions in crude fat content in DDGS would result in a reduction in digestible energy (DE), ME and NE content for swine. As a result, NRC (2012) provided estimates of energy and nutrient profiles of DDGS categorized based on crude fat content. Unfortunately, there were limited data on the ME content and nutrient profiles for medium-oil (n < 13 for 6-9% crude fat DDGS) and low-oil (n < 2 for less than 4% crude fat DDGS) sources at the time of publication. Therefore, these published values do not accurately reflect the variation in nutrient content of the majority of reduced-oil (5-9% crude fat) DDGS sources currently available from U.S. ethanol plants. 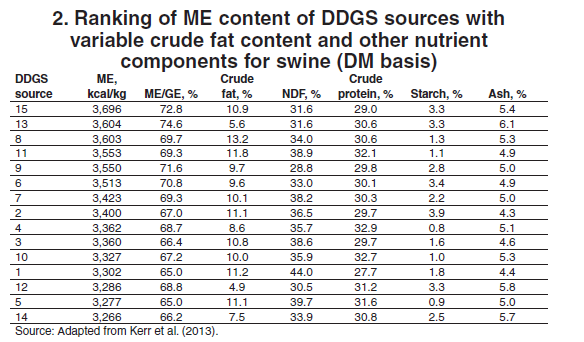 Subsequent research studies (Kerr et al., 2013 and 2015) have clearly shown that crude fat content is a poor single predictor of DE, ME and NE content for swine (Table 2). It appears that this poor relationship between crude fat and energy value is due to the relatively high variability in ether extract (crude fat) digestibility (52.7-81.2%) and NDF digestibility (44.5-61.5%) among DDGS sources (Table 3). To manage the inherent variation in chemical composition among DDGS sources, some commercial feed manufacturers identify specific sources that meet their nutritional specifications and quality standards and work directly with DDGS marketers that have the capability of providing identity preservation of DDGS sources. These commercial feed companies develop preferred supplier lists to minimize variation in DDGS purchases through third-party marketers. Although these approaches are somewhat useful, perhaps the best approach is to use the recently developed and validated ME and digestible amino acid prediction equations, based on chemical composition of DDGS sources, to accurately and “dynamically” estimate the actual nutritional value of the source(s) being used. Several studies have been conducted to develop DE and ME prediction equations based on the physical and chemical composition of corn DDGS sources for swine (Stein et al., 2006; Pedersen et al., 2007; Stein et al., 2009; Anderson et al., 2012; Kerr et al., 2013) and to manage variability in ME content among sources. These equations have been cross-validated (Urriola et al., 2014) and further validated with a growth performance trial (Wu et al., 2016a). However, it is important to note that energy prediction equations from NRC (2012) should not be used for estimating the energy content of DDGS because they underestimate the actual ME content of reduced-oil DDGS sources (Urriola et al., 2014). Therefore, the most precise (prediction error = 144 kcal/kg) and accurate (bias = 19 kcal/kg) DE equation was: DE = -2,161 + (1.39 x gross energy) - (20.7 x NDF) - (49.3 x ether extract). The most precise (prediction error = 149 kcal/kg) and accurate (bias = -82 kcal/kg) ME equation uses the DE value obtained from the previous equation as follows: ME = -261 + (1.05 x DE) - (7.89 x crude protein) + (2.47 x NDF) - (4.99 x ether extract). Most recently, Wu et al. (2016b) fed growing/finishing pigs four DDGS sources with variable crude fat and estimated NE content and used growth performance responses, along with the NRC (2012) requirement model, to estimate the actual NE content of these sources. The NE estimates ranged from 2,182 to 2,915 kcal/ kg of dry matter (DM), with an average of 2,660 kcal/kg of DM. These estimates are substantially greater than those published in NRC (2012) but are similar to those reported by Graham et al. (2014). WU et al. (2016b) used the results from Kerr et al. (2015) and Wu et al. (2016a) to develop an NE prediction equation for DDGS with oil content ranging between 5.8% and 12.2% ether extract: NE (kcal/ kg DM) = -1,130.5 + (0.727 x gross energy) + (23.86 x ether extract) - (10.83 x NDF); (R-square = 0.99; P < 0.01). However, the accuracy of the predicted NE values for reduced-oil DDGS using this equation has not been validated in feeding trials with growing/finishing pigs. 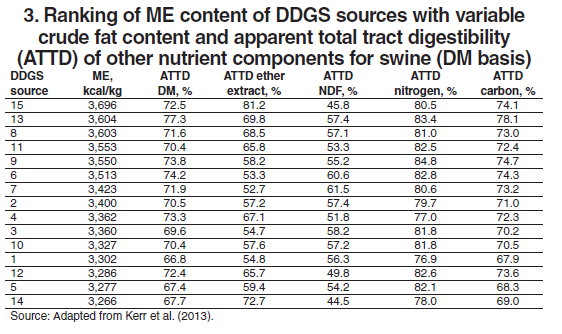 Summarizing all of the available published results, the most conservative estimate of NE content in reduced-oil DDGS is 2,012 kcal/kg, but using an average NE value of 2,374 kcal/kg of DM may be appropriate for most DDGS sources. Recently, Zeng et al. 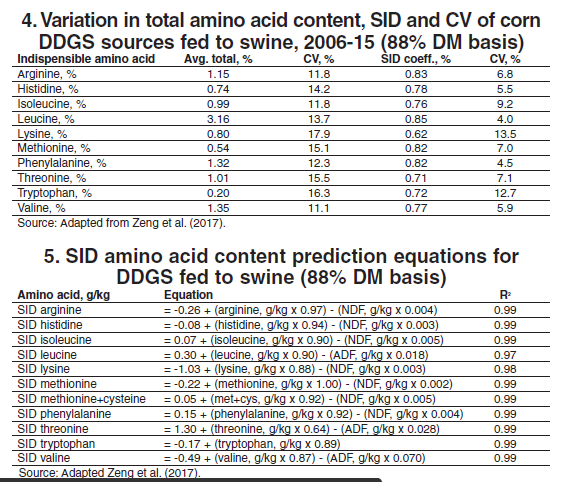 (2017) summarized digestible amino acid data sets from 22 peer-reviewed publications and one master’s thesis published between 2006 and 2015 (Table 4) and conducted a meta-analysis to develop standardized ileal digestibility (SID) amino acid prediction equations for reduced-oil DDGS for swine (Table 5). These data are more reflective of the actual chemical composition and variability among reduced-oil corn DDGS sources than those reported by NRC (2012) because they are based on 90 observations. Their results showed that the amino acid content and NDF or acid detergent fiber (ADF) content of DDGS are good predictors of SID amino acid content of DDGS for growing pigs, and the accuracy and precision of these prediction equations are much improved from previously published studies. As a result, these equations can be used to accurately estimate the SID amino acid content of a wide range of reduced-oil DDGS sources for swine. Anderson, P.V., B.J. Kerr, T.E. Weber, C.J. Ziemer and G.C. Shurson. 2012. Determination and prediction of digestible and metabolizable energy from chemical analysis of corn coproducts fed to finishing pigs. J. Anim. Sci. 90:1242-1254. Graham, A.B., R.D. Goodband, M.D. Tokach, S.S. Dritz, J.M. DeRouchey, S. Nitikanchana and J.J. Updike. 2014b. The effects of low-, medium- and high-oil distillers dried grains with solubles on growth performance, nutrient digestibility and fat quality in finishing pigs. J. Anim. Sci. 92:3610-3623. Kerr, B.J., W.A. Dozier III and G.C. Shurson. 2013. Effects of reduced-oil corn distillers dried grains with solubles composition on digestible and metabolizable energy value and prediction in growing pigs. J. Anim. Sci. 91:3231-3243. Kerr, B.J., N.K. Gabler and G.C. Shurson. 2015. Compositional effects of corn distillers dried grains with solubles with variable oil content on digestible, metabolizable and net energy values in growing pigs. Prof. Anim. Scientist 31:485-496. National Research Council. 2012. Nutrient Requirements of Swine. 11th Rev. Ed. National Academy Press, Washington, D.C.
Pedersen, C., M.G. Boersma and H.H. Stein. 2007. Digestibility of energy and phosphorus in ten samples of distillers dried grains with solubles fed to growing pigs. J. Anim. Sci. 85:1168-1176. Stein, H.H., S.P. Connot and C. Pedersen. 2009. Energy and nutrient digestibility in four sources of distillers dried grains with solubles produced from corn grown within a narrow geographical area and fed to growing pigs. Asian-Aust. J. Anim. Sci. 22:1016-1025. Stein, H.H., M.L. Gibson, C. Pedersen and M.G. Boersma. 2006. Amino acid and energy digestibility in ten samples of distillers dried grain with solubles by growing pigs. J. Anim. Sci 84:853-860. Tahir, M. M.Y. Shim, N.E. Ward, C. Smith, E. Foster, A.C. Guney and G.M. Pesti. 2012. Phytate and other nutrient components of feed ingredients for poultry. Poult. Sci. 91:928-935. Urriola, P.E., M. Li, B.J. Kerr and G.C. Shurson. 2014. Evaluation of prediction equations to estimate gross, digestible and metabolizable energy content of maize dried distillers grains with solubles (DDGS) for swine based on variable chemical composition. Anim. Feed Sci. Technol. 198:196-202. Wu, F., L.J. Johnston, P.E. Urriola, A.M. Hilbrands and G.C. Shurson. 2016a. Evaluation of ME predictions and the impact of feeding maize distillers dried grains with solubles with variable oil content on growth performance, carcass composition and pork fat quality of growing-finishing pigs. Anim. Feed Sci. Technol. 213:128-141. Wu, F., L.J. Johnston, P.E. Urriola, A.M. Hilbrands and G.C. Shurson. 2016b. Evaluation of NE predictions and the impact of feeding maize distillers dried grains with solubles (DDGS) with variable NE content on growth performance and carcass characteristics of growing-finishing pigs. Anim. Feed Sci. Technol. 215:105-116. Zeng, Z.K., G.C. Shurson and P.E. Urriola. 2017. Prediction of the concentration of standardized ileal digestible amino acids and safety margins among sources of distillers dried grains with solubles for growing pigs: A meta-analysis approach. Anim. Feed Sci. Technol. 231:150-159.